In the Information Age, we look to a new generation to guide us: persons who are willing to disrupt traditional business models, move quickly, and think ‘out of the box’. Robert Safian defines them as “Generation Flux – a group of people best positioned to thrive in today’s era of high-velocity change”. [i] He makes the point that being part of this generation has nothing to do with age, but rather adaptability; though I think younger generations are more familiar with the latest technologies and have less dependencies. 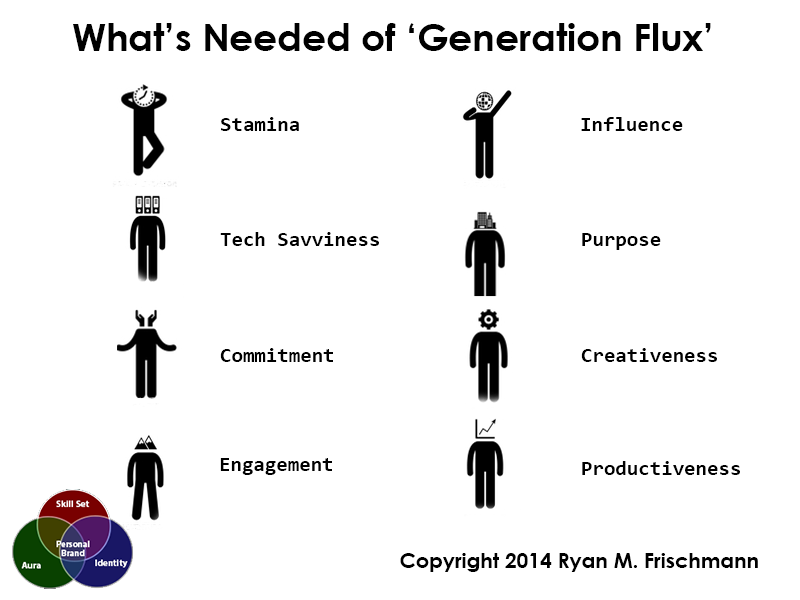 What is needed of ‘Generation Flux’? Stamina. We have all heard the sleepless dedication stories of startups. An initial cadre works together around the clock in tight confines to develop and take a service to market. They work hundred hour weeks now for a huge future payoff. This was the case with Apple, Facebook, Microsoft, Napster, Google, and countless other companies. In many of today’s company cultures, there is a blurry distinction between personal and professional time. Commitment. Young professionals delay getting married and having children to a later period in their life. Look at the recent perk offered by Apple and Facebook that allows female employees to freeze their eggs for later pregnancies. [ii] Because of fewer dependencies, it is easier to make a deep commitment with a company. Empowered. They are engaged and want to lead. According to a global survey, nearly 7 out of 10 millennials say that “achieving a managerial or leadership role is important to their careers”. [iii] Whether they step into leadership right away or work towards it, Millennials want room for growth. Creativeness. Being able to think of new, creative ideas is essential to fuel innovation. Much of our traditional education model is based on memorizing ‘facts and information’ and thinking in a confined rules based environment. Regardless, novel and adaptive thinking has become precious. [iv] Ted Coine and Mark Babbitt (2014). A World Gone Social: How Companies Must Adapt To Survive. New York: AMACOM. If you have the competency and passion to be a thought leader, it is a worthwhile endeavor. Of course, you must be highly intelligent because there is a lot of competition to become one. (This is why I do not suggest most people trying to become a thought leader; it is unrealistic.) It also requires due diligence to stay on top of the latest trends. Finally, it takes many years to establish a reputation. The payoff for being a thought leader is influence – something that has significant weight nowadays. Someone with thousands of followers and a high Klout score is a highly prized free agent; he or she carriers influence from job to job throughout a career. I have come up with another four roles related to sharing information; they are: thought curator, thought facilitator, thought provoker, and thought agitator. A thought curator is someone who passes and shares ideas with a target audience. Being a thought curator requires canvassing information, and then funneling or filtering it to an audience. Followers depend on a thought curator to feed them relevant information in their field. This role requires a strong presence in social media. A thought facilitator is someone who synthesizes information and insights on a platform for discussion. Being a thought facilitator requires putting information into online content and then moderating comments from an audience. This role requires managing a blog and/or discussion forum. A thought agitator is similar to a thought provoker but also emotionally charges an audience. Being a thought agitator requires delivering a consistent message that attracts both supporters and naysayers who want to hear what’s coming next. 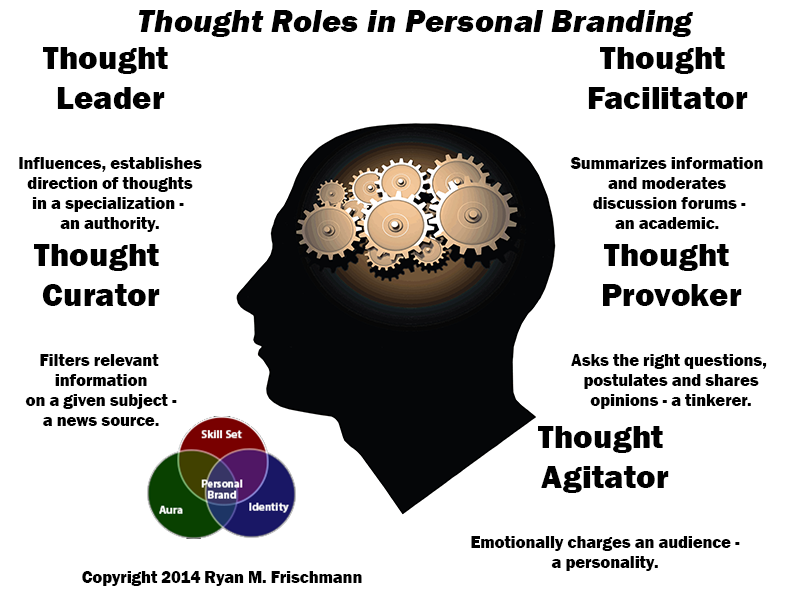 Becoming a thought leader might be too lofty of a goal for most of us, so consider taking on some combination of these other thought roles as a dimension of your personal brand. I recently read counter-arguments regarding the relevancy of personal branding. Some of the common themes include: heavy self-promotion, blog and social media commitments, and attention hogging. Still, I think most professionals benefit from projecting their online personal brand. Not all professions require an online presence… There are many jobs that do not require for you to be online and active in social media to perform your responsibilities. Although, considering how often a typical professional changes jobs and careers, you might be investing for something later in your career by establishing credibility and connections. Perhaps it leads to a second career. Not all professionals have to self-promote… Too many professionals associate personal branding with self-promotion, which is a big reason why they are turned off to it. I cannot deny that there is usually some self-promotion in personal branding; though, it might only play a minor role and does not have to be excessive or emphasized. I define a functional model for online personal branding that relies less on self-promotion. I emphasize presenting and validating a skill set, radiating an authentic personality, and being connected. I also argue that prevention content, balances promotion content. So professionals have to engage in varying degrees of self-promotion and sometimes very little of it, yet benefit from online personal branding. Not everyone has to blog and Tweet regularly… I agree that not all professionals have to blog or Tweet on a regular basis, especially if your job does not demand it. Adding these time-consuming responsibilities is something the personal branding naysayers harp on. Regardless whether it is a job requirement, create and curate content if you have something say! Why not? It is technically feasible (it is a file on your computer or mobile), so challenge yourself to be insightful in your area of expertise. Only leaders and marketers must participate in personal branding… Most personal branding experts assert that if you have an online presence in social media then you should consider how it reflects on you; this reflection is essentially your online personal brand. It is clear that the majority of young Americans use social media; eighty percent of Millennials use Facebook. Many professionals use LinkedIn; there are currently 100 and 200 million monthly active users in the US and outside the US, respectively. Therefore, since most professionals participate in social media, most professionals should think about online personal branding. Why does it matter? Most employers are going to check out your digital footprint before hiring you, regardless of the nature or your work. 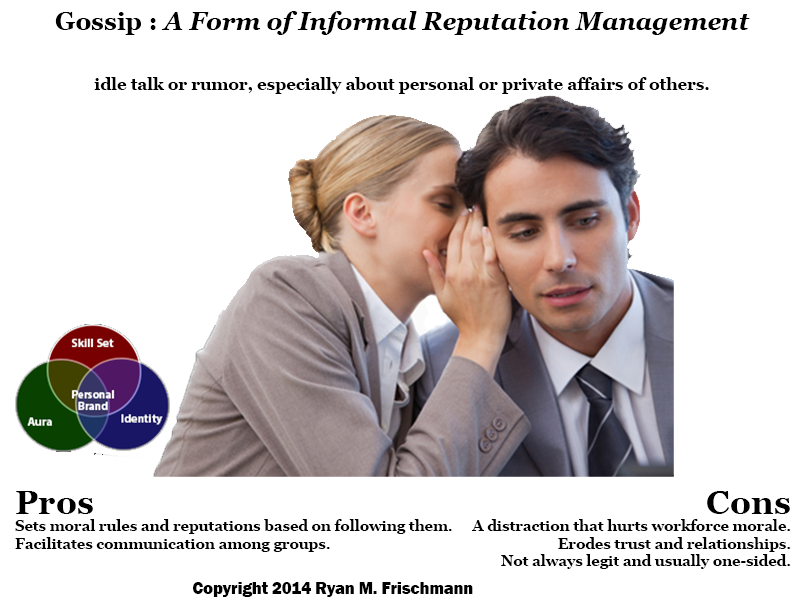 You should also have some understanding regarding the impressions you leave with your connections in social media. Why not project a meaningful, unified representation of you as a personal brand? Personal branding is a waste of time… It can be a deep, effective way to plan and develop a career for most people. You think of a holistic view of yourself – something that is much deeper than planning a degree or profession. You are forced to think about skills, core-competencies, weaknesses, personality traits, values, passions, interests, impressions, relationships, and vision. And then once you commit, you self-reflect, continually learn, works towards mastery, follow a regiment, solicit feedback, and connect with an audience. Personal branding is a powerful maturation process. Personal branding is all about the number connections you make…It does not have to be. In fact, I discourage professionals from hastily making a ton of connections to gain influence – avoid getting enamored by the ‘network effect.’ Instead, I suggest patience and restraint. First, get your identity squared away. Second, identify a reasonable target market. Third, calibrate the release of content and adding new connections – aim for a steady stream. An effective personal brand is based on differentiating your skills and talent within the boundaries of your target market (not the entire world). Do not need to personal brand, so a personal website is unnecessary… A personal website acts as a centerpiece of an online personal brand and a replacement to a standard resume, becoming what I call a ‘multi-dimensional resume’. I read a blog where an author delineates between a ‘branding personal website’ and a ‘resume website’. Disagree with this separation. You should have a single website that adapts to various career stages; sometimes it is an employment evaluation platform and sometimes it effectively projects your brand. Since there is significant overlap in content and you want to establish an online identity, a single website works best. Ultimately, a personal brand is the best representation of you anyways. 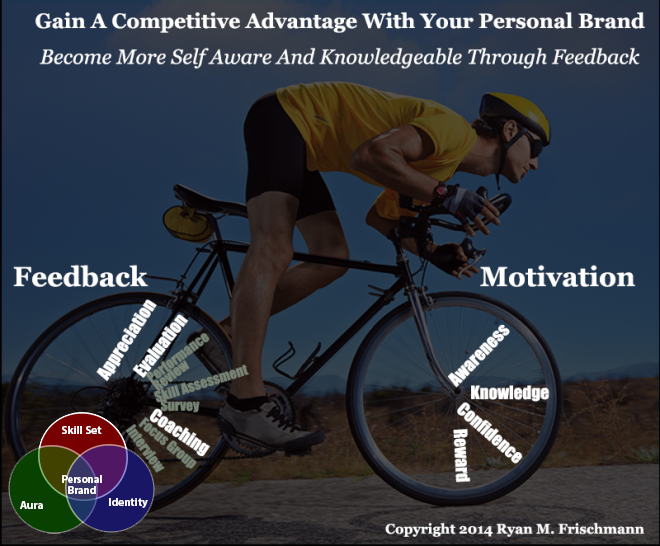 In developing an online personal brand, you must solicit feedback throughout your career. Much of an online personal brand is based on impressions, so it is up to you to understand them. It is a matter of not only accepting feedback as it comes naturally to you (like a performance review), but also building it into your normal routine – conversations, focus groups, emails, etc. Moreover, when you do get feedback, you should be prepared as a receiver to make the most out of it. You want to ask the right follow-up questions, for example. Optimize the experience by preparing yourself as the receiver and those giving you the feedback as the givers. According to the book Thanks for the Feedback, there are three types of feedback: appreciation, evaluation, and coaching. You want to get each type of feedback, but keep them separate. Naturally, you want to have some positive feedback in the form of appreciation. Everyone needs some form of loving; it is what fuels our motivation. Start by getting some general comments and perceptions from your audience. Are you getting appreciated the way you think you should be? With the evaluation aspect, try to get quantifiable ratings that you can use in a longitude study – something you can compare results over a period of time. This might be rankings or grades. A typical performance review includes a lot of evaluation feedback, which is often tied to compensation and promotions. Be proactive. Do not rely on HR personnel and leadership to perform the task as a formality because it is your opportunity. Leave open the possibility for feedback givers to coach you. You might try to do some prompting with open-ended questions, where you get some valuable nuggets of advice. When I review the results of a survey, I always start by reading the unadulterated comments. As you pick an audience, make sure you include a wide sample of people you work or interact with on a normal basis. Make sure there are workers with a lower status than you. They might have a refreshingly different perspective on things, so give them a chance; let them speak openly and freely without fearing your wrath. Douglas Stone and Sheila Heen. Thanks for the Feedback: The Science and Art of Receiving Feedback Well. Penguin (2014, New York). In Invisibles, David Zweig talks about brilliant professionals whose work goes unrecognized (“invisibles”); usually someone up the chain gets the glamour. Some examples in the book include (in parentheses who gets the credit): a structural engineer (an architect), perfumist (a celebrity whose name is on the bottle), a sound engineer (a rock band), and a cinematographer – (a director). There are of course many other examples. Zweig’s first trait of an Invisible is an ambivalence towards recognition. Revolving Door: Who gets the recognition? He goes into painstaking detail to explain precisely what these invisibles do. Why does he take so much effort doing this? So you appreciate the complexity of a task that might otherwise seem mundane or facile, perhaps not deserving of your recognition. Tuning a concert piano, translating from one language to another, and creating a perfume (examples in the book) require meticulousness – a second trait of an invisible according to Zweig. Invisibles are expected to not make mistakes. An architect has faith that his structural engineer designs a building that will not fall down; a rock band performing to thousands of fans has faith that his studio engineer properly tuned and configured the instruments. Zweig’s third trait of an invisible is the savoring of responsibility. I think David Zweig challenges the need for self-promotion and recognition in what he calls the “era of micro celebrity” – something driven by social media. The absence of recognition has nothing to do with compensation as all of the invisibles make enough money, but rather other extrinsic motivators: respect from an audience, verbal acknowledgement or praise, higher status, and awards. From within, these professionals are intrinsically motivated to work towards perfection. Is all the extra fluff necessary? I spout off that almost all professionals should do some form of personal branding. For the invisibles, personal branding would be helpful in landing their gig; but after that, an online presence and self-promotion seems unnecessary. Invisibles are journeymen who have found lifelong careers where they leverage their core competencies. None of them seem destined for a major career change. Most professionals face career changes, however. 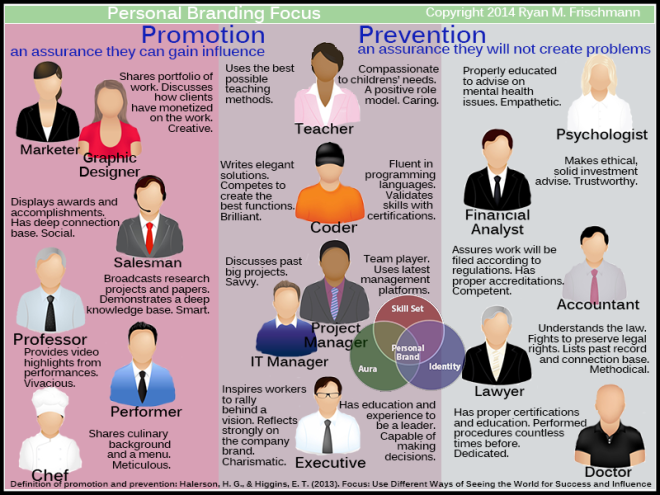 Personal branding is an effective way to go through a career transition. It helps you focus on a vision and clarifies what needs to be done to move forward. Moreover, for many professions, our ruggedly individualistic society forces us to be assertive. We are in a non-stop series of competitions – for clients, partners, jobs, and/or an audience. To differentiate, I suggest developing a personal brand. How else do you gain influence over a target audience? David Zweig. Invisibles. Penguin Group (New York, 2014). Author TheProfessionalWebsitePosted on July 28, 2014 July 28, 2014 Categories Personal BrandingTags invisibles, personal brandingLeave a comment on Who Gets the Recognition? Whenever possible, you should follow a logical progression as you construct an online personal brand. (I say ‘whenever possible’ because for many of us it is something we have to react to what is already out there.) But ideally speaking, you want to establish an identity before projecting it onto networks and social media. And as you construct your personal brand, you want to get a handle on how others perceive you in stages. So you can respond and take control of impressions before releasing your personal brand to an entire target audience. Finally, it is an ongoing commitment so it requires constant attention and monitoring. I created a simple ladder of eight steps to illustrate this progression, and once you get there, there are another four things you should consider doing in perpetuity; personal branding is a career long endeavor. Become self-aware. Take personality, interests, and/or strengths test to get a firm grip on what you are all about. Take inventory of brand assets. What content, core competencies, or knowledge do you already possess? Identify a target market. List clients, associates, potential employers, and whoever else you are trying to reach. It is not all about you. Conduct competitor analysis. Know who you are competing against, so you can differentiate and benchmark. Build a personal website. This is the centerpiece of your online personal brand; it is something you will keep throughout your career. Create social media profiles. If you do not already have an account, build a profile based on the intended purpose of the service and what you are trying to project. If you already have an account, you want to repurpose what’s out there to fit your personal brand. Get feedback. Release the ‘Alpha’ version of your personal brand to a small cadre to get an understanding of their perceptions. Respond accordingly. Start making connections. Now you are ready to reach out to your target audience.